Extreme close-up of the eye of a gray whale, Our guests enjoy a personal interaction with these mammals of the sea. There are some adventures or vacations that are burnt into the cerebral cortex forever. Many others, probably most, are enjoyed and soon forgotten. Whale watching in San Ignacio Lagoon is one of the ones you will never forget. No wonder it is listed as one of the 100 things you must do before you die! The attractions are the eastern North Pacific gray whales that come to the lagoon, many return year after year to birth their calves and stay long enough for their offspring to get strong enough for the treasonous trip back to the Alaskan water where they feed the rest of the year. While in the protected lagoon, their entertainment is to take care of their young and gleefully watch the human hanging out their boats (know locally as pangas) trying to get their attention so that the whales approach the pangas. Sometimes these magnificent creatures approach the humans and blow water on them, as they laugh and cheer. Sometimes, they get close enough for the humans to touch their snout while furiously taking large amounts of pictures. Sometimes, they decide to play with the humans, teasing them and get close enough so that you can kiss them. I did! and will never forget the experience! I kissed a whale, and I liked it! Perhaps it is better described as Gray Whale Encounters, the term Whale Watching seems so inadequate. My adventure began by contacting Ecotours Baja Sur though their website (www.ecotoursbajasur.com) and choosing one of their adventures. They have a 5 day-4 night plan with 3 full days of whale watching, or the one I chose of 6 days-5 nights that also includes a land tour to see the cave paintings of La Cueva del Ratón and a visit to the Mission of San Ignacio Kadakaamán, more on that later. There is a very inexpensive Alaska Air direct flight from Los Angeles to Loreto. At the Loreto International Airport, I was met by a very kind and accommodating guide named Carlos. Carlos took us to the waiting Cessnas for a short flight to the San Ignacio landing strip. We then walked a few meters to the cabins behind the landing strip and were assigned ours. The temporary seasonal cabins are laid out in the shape of a hexagon with a common area in the middle. The wooden structure provide much more protection from the wind and chilly winter environment for guests than do tent sites, making for a great place to return to at the end of the day of whale encounters. Each cabin is large, with 2 queen beds with foam mattresses, using regular linen and blankets (not sleeping bags and liners), and a full bath with a hot shower and marine toilet (other operators have communal wood chip composting toilets and outside showers). Happy hour is every day including the arrival date and a good time to meet and hang out with the other adventurers. I can not say enough about the great service, tasty meals and pleasant accommodations in this all-inclusive adventure. The next morning, after a great breakfast we boarded the panga, rode to the viewing area, and spent 1½ hours hanging out of the boat, laughing, splashing the water to get the attention of the mamas and babies, teasing, calling, photographing, with some luck touching, caressing or (yes!) kissing the gray whales. Back to camp for rest, lunch and back out in the afternoon for another exhilarating outing, coexisting with these gentle beautiful animals. Returning to camp to rest, happy hour, dinner, talks with fellow adventurers and presentations with the knowledgeable staff. Get a good night sleep and do it again for two more days, WOW! * The grays are really large. Adults can grow to 45 feet or more and weigh as much as 40 tons. Babies, known as calves, are relatively petite (15 to 16 feet long and as much as 2,000 pounds). * Their skin feels a bit like Naugahyde, but no “naugis” were hurt. All of them — even the infants — have patches of skin that are covered with "lice," which are tiny crustaceans. * The first time a gray opens its mouth, you will notice several rows of baleen attached to the upper jaw. Grays are filter feeders and, after scooping up water and sediment, they use the baleen, which feel like toothbrush bristles, to hold the crustaceans, tube worms and krill they eat. * There they blow! What's more, they seem to like to shower the humans with whatever comes out of the blowholes. (Grays have two of them.) Humans seem to enjoy getting wet with whale snot, because they always laugh and encourage them to do it again. * The eastern North Pacific gray whales were hunted almost to extinction but, thanks to conservation efforts, the population is now estimated at up to 25,000. And on the fifth day … we went on a land tour. After breakfast and traveling about 24 miles of dirt and pavement road of salt flats, sandy arroyos and other desolated landscape, we arrived at the town of San Ignacio, a real oasis in the middle of a semi-arid desert, with palm trees, a river and the magnificent mission of San Ignacio Kadakaamán. This is one of the prettiest and best kept missions in Baja California. We toured the mission and the park in front of the church with 400-year-old trees, while our guide obtained the permits to enter the mountains of the Sierra de San Francisco and La Cueva del Raton. This well-preserved cave was used for shelter by the “cochimí” natives. Thousands of year ago, they painted human figures as well as pumas, rabbits, goats, and deer on the rocky wall’s, using black and red colors extracted from the local plants. In more modern times this cave was also used by the "californios" for shelter and protection from the wild animals, such as mountain lions. This archeological site has been declared a World Heritage (Patrimonio de la Humanidad) by UNESCO and has been named as one of the most important sites at World level. The next morning after, breakfast, packing, and lunch, we boardied the Cessnas’ for the flight back to Loreto. You can fly back to Los Angeles that day if you wish, or better yet, stay and tour Loreto for a couple of days. 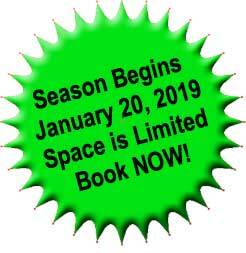 The camp accommodates only small groups and the season is limited to January 20, 2019 to the end of April, so make your reservations now. WHALE WATCHING IN SAN IGNACIO LAGOON, BAJA CALIFORNIA SUR, MEXICO.